In Microsoft Windows, Group Policy Object (GPO) controls the network by providing an integrated platform for the management and configuration of operating systems, applications and user settings in the Active Directory environment. Group Policy settings are stored in Group Policy Objects which can be associated with Sites, Domains and Organizational Units. In large organizations, there can often be more than one administrator who takes care of the network through the Group Policy Management Console (GPMC). It’s important to audit Group Policy changes in order to determine the details of changes made to Group Policies by delegated users. Group Policy Objects are stored at two different places: “Group Policy Template” and “Group Policy Container.” The Group Policy Templates are stored in the “%sysroot%\SYSVOL” folder. To monitor Group Policy changes, administrators must enable Group Policy change auditing and SYSVOL folder auditing. To monitor Group Policy changes completely, you must enable the auditing of DS Objects, Group Policy Container Objects and SYSVOL folder. Go to Start Menu -> Administrative Tools. 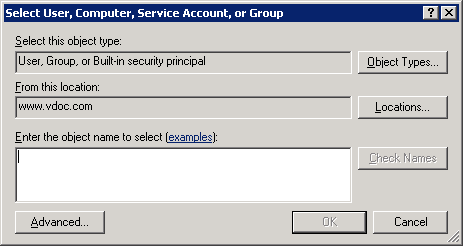 Launch “Group Policy Management Console”. Go to Forest -> Domains -> Domain Controllers. Next, you will have to right-click on the “Default Domain Controllers Policy”. From the context menu, click on “Edit” to open the “Group Policy Management Editor” window. 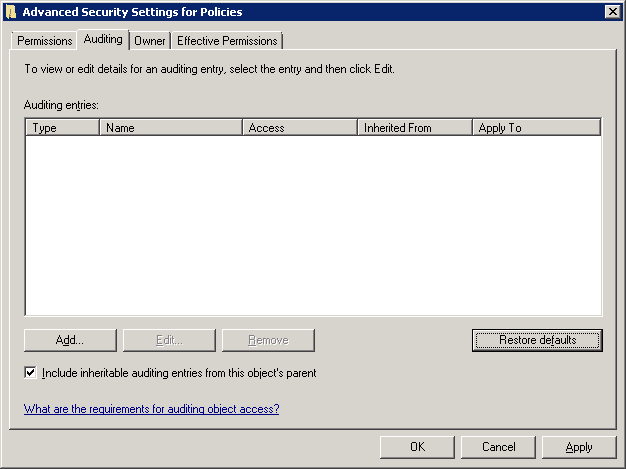 After the editor window opens up, go to “Computer Configuration” -> “Policies” -> “Windows Settings” -> “Security Settings” -> “Advanced Audit Policy Configuration” -> “Audit Policies”. For each of these policies, you will have to double-click on them one by one, and enable both “Success” and “Failure” auditing. In order to enable the auditing of “Object Access” -> “Audit File System” in “Advanced Audit Policy Configuration”, follow the same steps. Launch the ADSIEdit.msc (Active Directory® Service Interfaces Editor). Go to the left pane and right-click on the root “ADSI Edit”. Select “Connect to” option from the context menu. 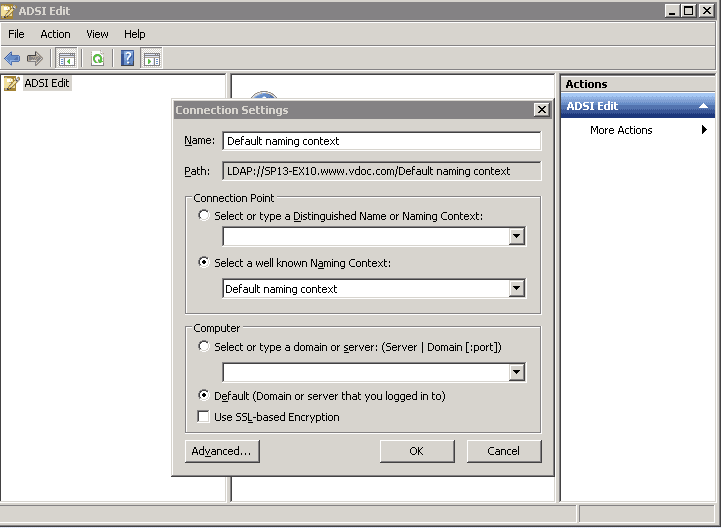 Connect to the current domain controller (DC), which appears with “Default Naming Context”. In the left panel, a tree will appear. Double click on the node of “Default naming Context” and go to “DC=www,DC=domain,DC=com” -> “CN=System” -> “CN=Policies”. Right click on the “CN=Policies” and navigate to Properties. Go to “Security” tab and click on “Advanced” button to access its Advanced Security Settings. Navigate to “Auditing” tab in the Advanced Security Settings. Use the “Add” button to add the user for whom the auditing has to be enabled. The following window appears. Enter name of the user for which you want to enable the auditing. You can also type “Everyone” to audit all users’ changes. Click “Check Names” to confirm the username. Choose the entries for which the user’s action will be audited. Select “Full Control” for auditing both “successful” and “failed” events. Select the “Apply these auditing entries to objects and/or containers within this container only” checkbox to apply the changes to the child objects as well. Click on “OK” to apply these auditing entries. “Auditing” tab of Advanced Security Settings will appear. 3. Configuring SYSVOL folder auditing. In the Windows Explorer, browse the %systemroot% folder. Go to the “SYSVOL” folder, and right-click on it. Click on “Properties”. Navigate to the “Security” tab and click “Advanced”. The “Advanced Security Settings” for SYSVOL folder will be displayed. Navigate to “Auditing” tab, and click on the “Edit” button. The following auditing settings will be displayed. Click on “Add” button to add the user for which the auditing has to be enabled. You can also choose to audit the files and sub-folders as well. 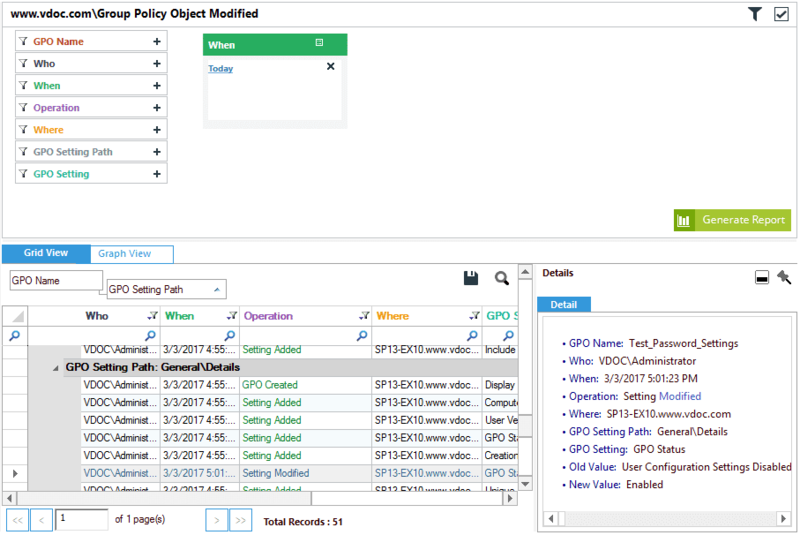 After the above auditing setting has been applied, every change in the GPO will be tracked and viewed from the Event Viewer. However, the “Event Viewer” will show the events in a format that can sometimes be difficult to read or understand. Details specific to “Who, What, When and Where” will not be displayed in the same place, and before and after values will not be available side-by-side.